Are you suffering from symptoms of Carpal Tunnel? 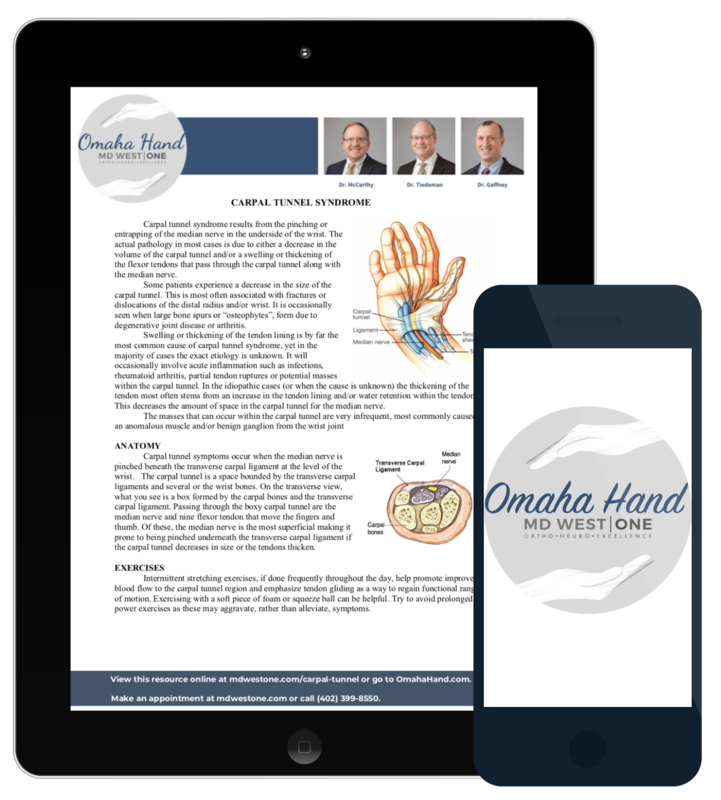 The Omaha Hand & Wrist Specialists at MD West ONE are able to properly diagnose and treat carpal tunnel syndrome through both surgical and non-surgical treatments. If you have the following symptoms, you may want to make an appointment with one of our Board Certified Specialists. Meet MD West ONE's hand specialists and learn more about how they treat carpal tunnel. Carpal tunnel syndrome results from the pinching or entrapping of the median nerve in the underside of the wrist. The actual pathology in most cases is due to either a decrease in the volume of the carpal tunnel and/or swelling or thickening of the flexor tendons that pass through the carpal tunnel along with the median nerve. Some patients experience a decrease in the size of the carpal tunnel. This is most often associated with fractures or dislocations of the distal radius and/or wrist. It is occasionally seen when large bone spurs or “osteophytes”, form due to degenerative joint disease or arthritis. What is the Cause of Carpal Tunnel? Swelling or thickening of the tendon lining is by far the most common cause of carpal tunnel syndrome, yet in the majority of cases the exact etiology is unknown. It will occasionally involve acute inflammation such as infections, rheumatoid arthritis, partial tendon ruptures or potential masses within the carpal tunnel. In the idiopathic cases (or when the cause is unknown) the thickening of the tendon most often stems from an increase in the tendon lining and/or water retention within the tendon. This decreases the amount of space in the carpal tunnel for the median nerve. The masses that can occur within the carpal tunnel are very infrequent, most commonly caused by an anomalous muscle and/or benign ganglion from the wrist joint. Carpal tunnel symptoms occur when the median nerve is pinched beneath the transverse carpal ligament at the level of the wrist. The carpal tunnel is a space bounded by the transverse carpal ligaments and several or the wrist bones. On the transverse view, what you see is a box formed by the carpal bones and the transverse carpal ligament. 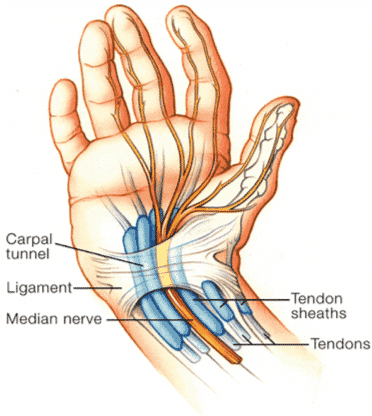 Passing through the boxy carpal tunnel are the median nerve and nine flexor tendon that move the fingers and thumb. 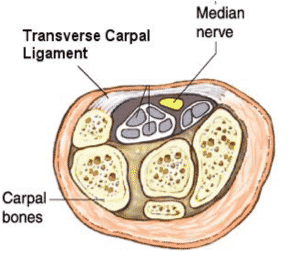 Of these, the median nerve is the most superficial making it prone to being pinched underneath the transverse carpal ligament if the carpal tunnel decreases in size or the tendons thicken. Click the button below to download the PDF version of this carpal tunnel information. By downloading the PDF, you can easily print the resource or save it to your desktop or mobile device for future use. Intermittent stretching exercises, if done frequently throughout the day, help promote improved blood flow to the carpal tunnel region and emphasize tendon gliding as a way to regain functional range of motion. Exercising with a soft piece of foam or squeeze ball can be helpful. Try to avoid prolonged power exercises as these may aggravate, rather than alleviate, symptoms. Nerve conduction studies and Electromyogram - These are “nerve tests” which are used to evaluate for carpal tunnel syndrome and additional nerve disorders. These are very safe tests that allow us to document the entrapment or compression of the median nerve at the wrist. Although not currently done in our office, we will coordinate the necessary tests with you to document the presence and severity of carpal tunnel syndrome. X-Rays - Radiographs are done infrequently for carpal tunnel unless there is an associated condition needing evaluation. Many patients may have an associated concern for arthritis and an X-Ray is often obtained to assess this. However, an X-Ray is unnecessary to diagnose carpal tunnel syndrome. Ultrasound - This is a relatively new tool that we are using for screening. If definitive changes are demonstrated, a nerve conduction study may not be necessary. Bracing is the gold standard treatment for carpal tunnel syndrome. It can be successful with multiple types of braces. The purpose of the brace is to hold your hand in a neutral position. It does not need to be a rigid construct but rather simple braces that keep your wrist from moving in extension or flexion will achieve similar results. These should not be strapped tightly. Braces are worn primarily at night, when most symptoms occur, but can be worn during the day for repetitive activities such as prolonged driving or those that require heavy or strenuous movement. To our knowledge there is not a specific brace that has been shown to have a significant benefit over another; one that is comfortable for you is preferable. There are several medicines which have been utilized for carpal tunnel. Non-steroidal anti-inflammatory drugs - The most common of which is over-the-counter Ibuprofen or Naproxen. These medications reduce pain and have been shown to help some patients with carpal tunnel syndrome. Steroids - A short steroid course may be considered with carpal tunnel syndrome patients if circumstances include inflammation and/or substantial swelling. Several other medications have been tried and are infrequently used at MD West ONE. These include diuretics (water pills), Vitamin B6, etc. Carpal tunnel injections - Occasionally, for diagnostic as well as therapeutic reasons, a steroid injection can be administered in a sterile fashion for carpal tunnel syndrome. This often improves patient symptoms for two to three months and may allow adequate symptom relief until a more favorable time for potential intervention such as surgery can be identified. If after an adequate trial of conservative treatment patients still have symptoms, surgery may be considered. There are two real camps amongst hand surgeons when it comes to carpal tunnel syndrome. Open carpal tunnel release - This procedure has been done since the 1950’s and involves an approximate 3 cm incision over the palm. With direct visualization, dissection carried down to the ligament and the ligament is divided. Endoscopic carpal tunnel release - The endoscopic technique has been utilized over twenty years in our practice and involves a single transverse incision, approximately 1 ½ cm in length, at the wrist crease. The ligament is divided using the endoscopic device with direct visualization of the ligament achieved. Both of these techniques are done extensively at MD West ONE. We have expansively researched the two and have determined appropriate indications for each. Concerns over potential complications are appropriate. Complications include those typically associated with surgery such as anesthesia and infection. Unique to carpal tunnel surgery, one must to be aware that potentially a nerve, artery or a tendon can be potentially injured with either surgical technique. This would be extremely rare but remains a possibility that will be addressed if ever encountered. Nighttime symptoms and numbness are typically relieved and patients often note an improvement soon after surgery. Constant numbness or weakness present before surgery could be a sign of nerve damage and result in incomplete relief. Maximal improvement may take several months and in some cases more than a year. Pain experienced after carpal tunnel surgery is variable. Suggestions for decreasing pain and inflammation include: elevation of the involved limb, frequent ice application for 10-15 minute intervals, and medication (Tylenol, Advil or narcotic pain medicine prescribed at the time of surgery). Gentle exercises and light use of the hand(s) are encouraged beginning the day after surgery. You are allowed to perform tasks of daily living as your pain level permits. Splints will be placed on your hand(s) post-operatively and their use is encouraged until at least the time of your first post-operative visit. Range of motion of the fingers is important as it helps the nerve to glide so adhesions do not form. Modifying the way you use your hand(s), however, is advisable. Specifically, keep your wrist in a neutral or extended position. Simultaneous wrist and finger flexion should be avoided for the first several weeks after surgery. Forceful grasping or heavy lifting (> 5lbs) is also discouraged. Ensure that the wound is kept clean and dry. The dressing placed during surgery may be removed after 2 days and a new dressing or band-aid applied. Showering is permissible at that stage, but refrain from soaking the incision in a bath or swimming. In general, wear your splint to drive, work or sleep. Driving is allowed as soon as you feel comfortable enough to do so. Your first post-operative visit will be scheduled approximately 7-10 days after surgery. Your stitch will be removed at that time and the wound assessed. Edema (swelling) control, scar massage and desensitization techniques are initiated when the incision heals. Scar massages can be performed with a moisturizing lotion (cocoa butter, vitamin E lotion, etc.). Apply gentle but firm pressure to the wound with your opposite thumb in a circular fashion for up to 5 minutes, 2-3 times a day. The following range of motion exercises can be initiated after surgery and continued for the first 4 weeks. Perform each exercise 10 times, 3-5 times a day. Grip strength is typically diminished after surgery but generally starts to noticeably improve after the first month. There will be a steady increase in strength for 6 months. These exercises will help restore thump motion and opposition. For the first month after surgery, patients will usually have some level of tear sensitivity, palmar tenderness and weakness. With techniques noted above, those symptoms will gradually fade. Splints can be discontinued as the patient’s pain level allows. Work restrictions may be necessary for a 4 to 6 week period post-operatively depending on the work demands. All of the hand surgeons at MD West ONE are recognized members of the American Society for Surgery of the Hand. It is the oldest and most prestigious medical society dedicated to the hand and upper extremity. The mission of the society is to advance science and practice of hand and upper extremity surgery through education, research, and advocacy on behalf of patients and practitioners. These physicians dedicate their time and energy to improving the patient experience and their knowledge in their field. For more information visit https://www.assh.org. Are you suffering from carpal tunnel symptoms? Don't wait any longer to get relief. Make an appointment to see one of our hand and wrist specialists.